The recent I-T raids at the residences of Small Scale Industries Minister and district in-charge Ramesh L. Jarkiholi, his brother Lakhan, their family members and trusted men and Karnataka Pradesh Mahila Congress president Laxmi R. Hebbalkar has opened a new chapter of political rivalry between Mr. Jarkiholi and BJP MLA from Belagavi rural Sanjay B. Patil. 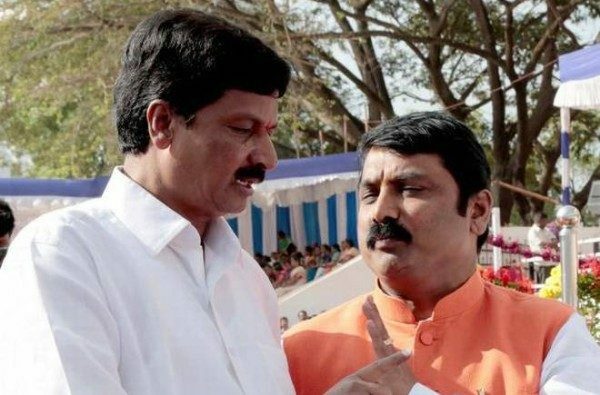 Mr. Jarkiholi allegedly held out a veiled threat warning Mr. Patil of “shani-kala” (bad time): “Shani will ride you hereafter,” Mr. Jarkiholi told Mr. Patil during a brief one-to-one conversation on the sidelines of Republic Day celebrations here on Thursday. Mr. Patil only retorted by saying that he had sailed several bad times in politics and business and that ‘shani’ was nothing new for him. He also told him that he was not dependent on politics only and had business and educational institutions to look after as well. In fact, Mr. Jarkiholi took Mr. Patil to the side immediately after the felicitation of freedom fighters and achievers and expressed his ire. He held Mr. Patil responsible for the I-T raids. He said it was not fair on the part of Mr. Patil to launch personal attacks in politics. Politics should not be mixed with personal issues, he told him. However, Mr. Patil made it clear that one of his supporters had complained against Ms. Hebbalkar (who was second runner-up against Mr. Patil in the last assembly elections-2013 and lost the electoral battle over a narrow margin of 2,511 votes) to the Enforcement Directorate, but not against Mr. Jarkiholi. Mr. Patil also cleared that he had no political rivalry against Mr. Jarkiholi and that it was only incidental that the I-T department had also targeted the latter. Mr. Patil, who confirmed what transpired between them late on Thursday evening, told THE HINDU that the complaint was made to the ED but not to the I-T department, which was a separate establishment. Mr. Jarkiholi was angry at him only because the I-T department also carried out raids at his house. He wondered how a complaint by a ordinary party worker to ED would lead to I-T raids. Rumble in the Jungle. The battle has commenced. Public is guaranteed a paisa vasool multi-starrer block buster.